By day, London is the greatest metropolis of the 19th century. By night, it is the hunting ground of monsters older than the empire itself. Above it all lurks Prince Mithras, Methuselah of Clan Ventrue and godhead of a cult infecting vampire and mortal alike. 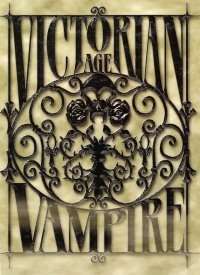 I would like to say that, regardless of your plans to ever run or use the Victorian Age Vampire rules in your game, the fiction trilogy is just WONDERFUL! Phillipe Boulle weaves characters and settings into a beautiful tale of Victorian horror and an exploration of the world of the damned that reads as well as any novel I've known. Those unfamiliar with the World of Darkness or Vampire: the Masquerade are introduced to setting through the eyes of a mortal attempting to unravel her family's dark past. Veterans of the game find characters we know and locales we heard about explored in ways never before seen. It's a treat for any reader. ...Okay, that's it. I'm not getting any kind of commission on the books, just wanted to share my love for the prose. This title was added to our catalog on March 29, 2006.